The High Resolution version of Neon offers numerous additional features over the Standard version. PSP's new linear phase equaliser plug-ins offer mastering quality at a project-studio price. Back in SOS June 2004, I reviewed the first EQ in PSP's range of high-quality plug-ins. I was very impressed by Master Q 's smooth sound, which compared very favourably with Waves' Renaissance EQ, among others, and its versatile selection of seven soft-clipping algorithms, which provided extra warmth and thickness. Now PSP have a second pair of EQ plug-ins to add to their range, but these are rather different. Most digital EQ algorithms, including those used in Master Q, employ Infinite Impulse Response filters, which have low CPU overheads but a non-linear phase response; some frequencies are delayed more than others, which can lead to a loss of depth and clarity. By contrast, Neon and Neon HR are 'linear phase' designs based on an analogue prototype, where each frequency is delayed by exactly the same number of samples. Although this design results in significant higher latency, transients and harmonics in particular can emerge from such an EQ with much greater transparency and detail. Linear phase designs are a lot more difficult to get right, and can 'ring' and suffer from 'pre-echo' on transients, but PSP have gone to great efforts to minimise such artifacts. If you want to hear the difference, you can switch between their linear phase and more traditional phase-warping IIR filtering modes to hear the difference. The Neon graphic interface is PSP's most impressive to date, with its brushed aluminium and wood finish, and also manages to be clear and easy to use. There are eight EQ bands that can be individually enabled or disabled, each offering identical options over the full frequency range of 20Hz to 20kHz. You can choose from seven filter types: low-cut or high-cut with either a 12dB/octave or 24dB/octave slope, low or high shelving with variable Q at the cutoff point, or variable Q peaking. The shelving and peaking EQs can have their gain varied by up to ±24dB in 0.04dB increments, and the overall frequency response is displayed in the EQ graph above the controls. If you hover over any band's control knobs, the response for that band alone is overlaid on the graph, while its current settings appear across the bottom of the display. This is perhaps not as useful as having the values appear below each control, as they do in Master Q, but you can double-click any control to enter a precise value, or directly click and drag each band's values in the EQ graph. The right-hand side hosts a clutch of extra controls, including a large zoom wheel that controls the EQ graph's vertical resolution, a Linear Phase on/off switch, output gain control with ±12dB range, and bypass button. The standard Neon has a fixed frequency resolution of 4096 samples, while the HR version offers two further options: High (8192 samples) and Max (16384 samples). These only make a difference with the linear phase mode on, and many musicians seem to be confused about what the different resolutions actually do for you. The maximum resolution doesn't improve the sound of the EQ: it simply changes its shape and allows 'tighter' Q settings, particularly at the bottom end. At 1kHz and above, I doubt that you'll even notice the difference when you switch resolutions, but below this frequency (and particularly below a few hundred Hz) you'll find changing to a higher resolution will let you set narrower peaks and troughs, at the expense of higher CPU overhead. Because the audio is processed in chunks, you should set your audio interface's buffer size according to the table in the Neon HR manual, depending on your chosen resolution and sample rate, or CPU overhead may rise significantly. I agree with PSP that unless you need surgically precise EQ at the low end, you should leave Neon HR at the Standard resolution to avoid wasting processor power. I spent some time auditioning the standard version of Neon with a wide range of material. With its Linear Phase mode inactive it certainly sounds good, although it provides less obvious 'character' than Master Q or Waves' Renaissance EQ. Engaging Neon 's Linear Phase mode suddenly brings more transparency, focus and depth, and unlike Waves' Linear Phase EQ, which is renowned for its neutral sound, there's still some added 'sweetness' at the top end. Sadly, there's no such thing as a free lunch, and while Neon 's latency is negligible in IIR mode, in LP mode it jumps to about 220ms for a single band, increasing to 545ms if you enable all eight bands. This is no problem when mastering, but makes using Neon in LP mode rather impractical during tracking. For those who wish to persevere, Neon version 1.1 lets you decide whether or not to report this latency to the host application so that it automatically compensates by creating huge buffers, and whether to include latency for all bands, for quick A/B comparisons, or just the currently active ones (this can give lower latency, but means a slower switchover when turning bands on or off). The basic Neon is pretty impressive at standard (44.1 and 48 kHz) sampling rates, but those who want to work at rates up to 192kHz will want to investigate the High Resolution version. 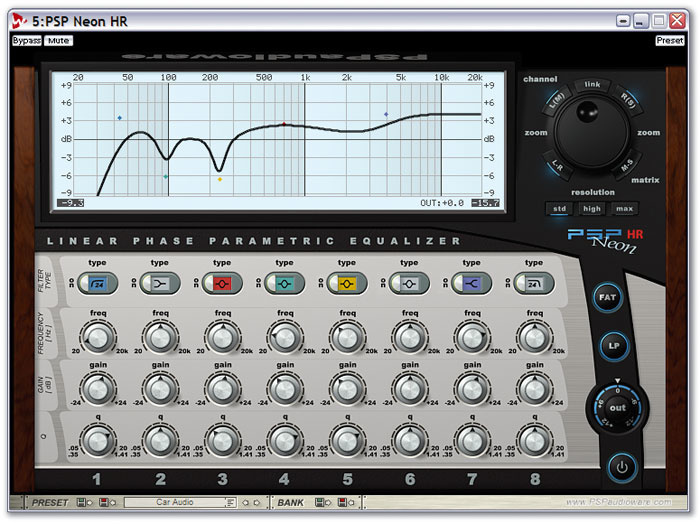 This provides additional features, including a proprietary FAT (Frequency Authentication Technique) oversampling mode, three frequency resolution modes (see 'Frequency Resolution' box), and extra buttons around the zoom control that provide independent EQ settings for the left and right channels, or independent control of Mid & Side EQ — both extremely handy for restoration or creative work. For me, the most exciting of these extra features is the FAT mode. Activating Neon HR 's FAT and Linear Phase modes together is a jaw-dropping experience, almost turning it from a digital into an analogue EQ — the high end is significantly smoother, sweeter and more natural, particularly when applying 'air' to transient-rich material like bells and percussion. PSP's FAT mode also featured in Master Q, but it makes a far more noticeable difference to Neon HR, and personally I doubt that I'd ever use it without the LP and FAT buttons permanently on. This is one impressive EQ! With a typical two-band setup, CPU overhead on my 2.8GHz Pentium 4 PC was just 1.5 percent in IIR mode, five percent in LP mode (which is very similar to the Waves Linear Phase EQ), and 10 percent with LP and FAT activated. However, since Neon is primarily a mastering plug-in, most users will probably only be running one instance, meaning that CPU overhead and latency won't be an issue. I did suffer a few glitches on my PC when radically altering EQ settings, but I seem to be the only user to do so, and PSP are already working on a cure. Sadly, there's one other feature of the HR version that won't go down so well with some potential users: unlike the the standard version, which uses challenge/response protection, it requires a Pace iLok dongle. While a huge number of Mac owners already have one of these (they only cost about $20 and can hold hundreds of licences), they are less common among PC owners, and although I've never experienced any Pace dongle problems myself during the last 10 years, they have the reputation of causing problems on a few machines. PSP have suffered greatly from piracy in the past, so I certainly can't blame them for joining many other developers in protecting their best algorithms by linking them to hardware. Think of it as serious protection for a serious EQ plug-in. Once again, PSP have raised their game, and Neon and Neon HR are both excellent-sounding EQ plug-ins that offer sweetness and transparency. Linear phase plug-ins are deliberately smooth and neutral in character, which makes them perfect for mastering, but they still all sound slightly different. For me, PSP's Neon HR has an 'analogue' quality that makes it shine. Some potential users of the standard Neon may be put off by its lack of 96kHz support, and some HR users by the iLok requirement, but for me, Neon HR is most definitely the star of the show. Superbly transparent, natural sounding EQ, especially with LP and FAT modes on. Incredibly versatile options in each of eight bands. The most sophisticated PSP interface to date. Standard Neon only runs at 44.1/48kHz. HR version requires iLok dongle. A few audio glitches on the review system when moving controls. If you want a transparent and focused-sounding EQ plug-in for mastering purposes, PSP's Neon could be just the job, and the HR version is audibly more sophisticated at the top end. Neon $149; Neon HR $299.